Mark Green thanks supporters after winning Marsha Blackburn's seventh district House seat. In District seven, which includes parts of Williamson County and the city Clarksville, GOP state Senator Mark Green will take over Marsha Blackburn’s seat, as she moves on to the U.S. Senate. Green tells WPLN he has three top priorities. "The overall focus is to decrease government spending, get real solutions for health care, not just throw money at a broken system, and helping our military get strong again," says Green. 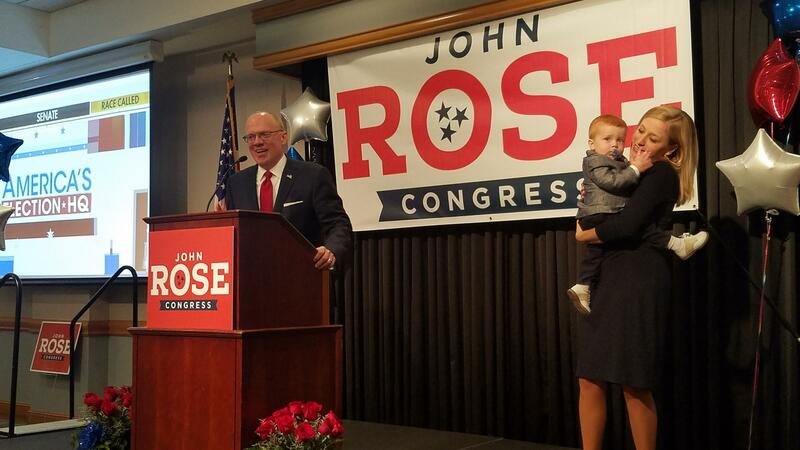 In the sixth district, comprising parts of Wilson and Putnam counties, John Rose, a farmer, will step into the position vacated by Diane Black. She stepped down earlier this year to run for governor, a race she lost. Rose is a farmer and businessman who largely aligns himself with conservative priorities, like cutting taxes and repealing the Affordable Care Act. However, Rose says he'll focus on ways he can directly impact the residents of his district — like extending access to high speed internet. "I happen to think that’s an area where the government can have a major impact is to build both transportation infrastructure that’s so important to our families right here in the sixth district, so they can get to job opportunities across the district, and also helping to build out broadband." And in East Tennessee, former Knox County mayor Tim Burchett is replacing Congressman John “Jimmy” Duncan, who had endorsed his opponent in the GOP primary. With all six incumbents easily winning re-election, the party breakdown among House members in Tennessee remains the same — seven Republicans, two Democrats.